Learn how Saved Searches work and how to create them. 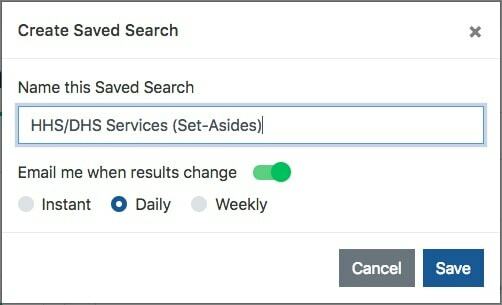 The Saved Search feature enables users to save a search query they construct on several search pages on GovTribe, using a combination of filters and keyword searching. Here is a short video walkthrough demonstrating how to use Saved Searches and Search Notifications. A written article with screenshots is below. Once you have constructed a search on one of the above search pages that you wish to save, simply click the Save icon. You will be given the opportunity to name your Saved Search and set your notification preferences. Instant notifications will send you a separate email for each update against the search parameters within about 15 minutes. Daily notifications will send you one email each morning at 9:00 AM Eastern time summarizing the activity from the previous 24 hours. Weekly notifications will send you one email every Friday at 10:00 AM Eastern time summarizing the activity from the previous 7 days. 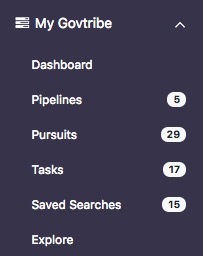 Once your search is saved, you can view and reopen them from the Saved Searches menu item under My GovTribe in your side menu.